Making a difference to people’s wellbeing and life chances is a key aim for many charities, but in order to be truly effective charities need to ask themselves whether or not their activities make a sustainable difference. Put simply, it’s the difference between giving somebody water, or giving them the tools to build their own well. One charity that does this really well is Emmaus (pronounced ‘Em-may-us’). The charity owes its existence to a French priest called Abbe Pierre who set up the first Emmaus community in Paris. His first beneficiary was a former prisoner called Georges, who had lost all hope and tried to commit suicide. In Abbe Pierre’s own words: “That is how Emmaus was born. Because, without giving it a second thought, I spontaneously decided to go against the very notion of charity. Instead of saying, ‘you are unhappy, I will give you a home, a job and some money’, the circumstances made me say quite the opposite. I could only tell him the truth, ‘you are dreadfully unhappy, and I have nothing to give you (…). But you, seeing as you want to die, you’ve got nothing to lose. So why don’t you come and help me help others?’ (…) ”. Emmaus now operates worldwide and was introduced to the UK in the early 1990s. There are currently 25 Emmaus communities across the country, providing a home for those who have, for a variety of reasons found themselves homeless, together with the opportunity to work and gain new skills and confidence. Each regional Emmaus operates as a social enterprise selling second hand goods and providing other services. Beneficiaries, known as ‘companions’, get involved in all aspects of running each Emmaus community and can gain qualifications which act as a stepping stone to independent living. There are over 600 companions in the UK and the charity plans to grow this by offering at least 750 companion places by 2017. At Emmaus Sheffield, 17 companions currently live onsite in the stunning converted Sipilia building, a former cutlery factory, bordering the canal. Their shop is a veritable Aladdin’s cave full of furniture, clothes, household goods and books. Companions participate in all aspects of running the store, collecting donated furniture and goods, serving customers, as well as helping to run the café and take care of the charity’s two pigmy goats and rabbits. Other commercial activities include undertaking repairs on furniture and carrying out electrical safety tests for retail outlets. In addition, the charity provides qualifications ranging from manual handling, to a diploma in social care. A particularly uplifting sight on my recent visit, was seeing a door marked ‘Boat House’ which transpired to be a workshop set aside for one resourceful companion who has embarked on building his dream boat. Companions stop receiving benefits when they move into Emmaus, except their housing benefit which goes to the charity to help fund their accommodation. All other funds are raised by their social enterprise activities and fundraising. In addition to their accommodation and food, each companion receives £35 a week in payment plus £10 worth of savings (which they can begin to draw upon once they have saved £100). John Jarrett, 47, has been living at Emmaus Sheffield for six months. Prior to that he was a companion at Emmaus Bedford, where he worked as a Community Assistant, supporting people moving into Emmaus. John has a long history of homelessness and drug use, combined with anxiety and depression. Since moving to Emmaus Sheffield he’s undertaken a digital business course and is responsible for managing the charity’s Facebook page and has started a blog. “Being at Emmaus has been the best rehabilitation for me – I’ve been clean from day one and I’ve been given a lot of responsibility which has improved my self-worth. Living as part of a community helps keep me well and for the first time in my life I wake up feeling content,” said John. Kris Becker, 34, was first in prison at the age of 19 due to criminal offences to fund his heroin habit. A key worker put him in touch with Emmaus when he left prison as he was no longer in touch with his family and had nowhere to go. Being at Emmaus Sheffield has given him a new lease of life: he’s passed his driving test and undertaken an NVQ in Health and Social Care level 2 and is working towards level 3. He’s also now working as a community support worker at Emmaus, helping others to overcome their issues. He explained: “I’ve been on the other side, so I can relate to people who feel like there’s no light at the end of the tunnel.” Kris is also back in touch with his family and also sees his two year old daughter. 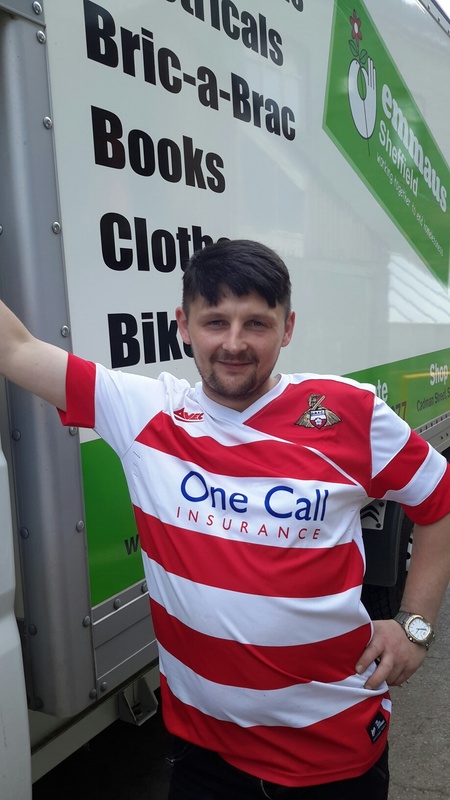 “Without Emmaus I’d be back on the streets, inside or dead,” said Kris “it’s not that I didn’t want to change before, I did, but here you get the practical support you need to make it happen”, said Kris. 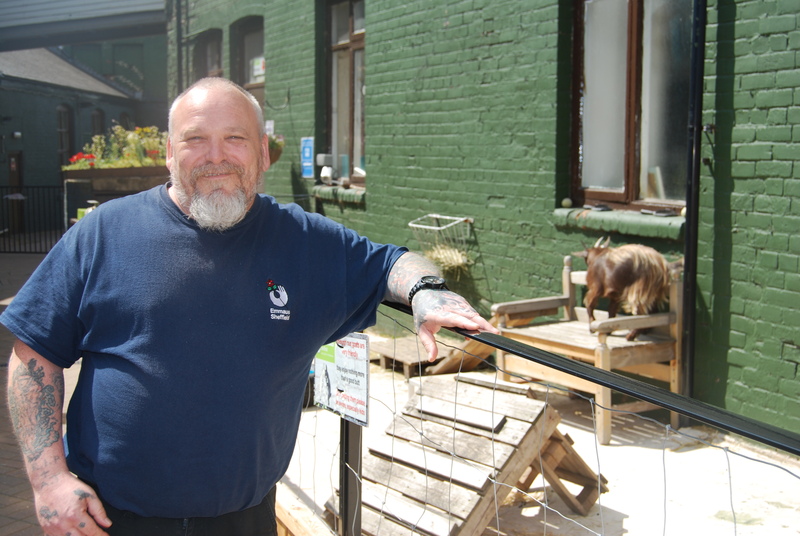 Graham has a background in the probation service and running hostels, but he says the reason he is so committed to working at Emmaus is that it really does have an incredible impact on people’s lives. He says the reason for this is that companions have a focus and structure to their day, rather than being in a system which focuses on people’s issues. He explained: “We do have quite strict rules – no drugs or alcohol, and everyone has to be up and ready for work at 8.45am, but giving people a meaningful role and restoring their self-belief is extremely empowering,” he enthused. “The proof really is in the pudding: one of our success stories is a former alcoholic who was involved in gang fighting and street crime who ended up living on the streets in Sheffield … following a three year period as a companion at Emmaus, he is now working full time in the health and social care sector,” said Graham. Emmaus can’t eradicate the problem of homelessness in the UK, but it does provide an innovative solution to hostels for getting people off the streets, whilst also improving their overall health and employment prospects – saving the governments over £6 million in the process. In human terms, the impact of Emmaus may be immeasurable and without doubt, it helps people build their own well. well read’s communications strategies are informed by the current news agenda, as well as what relevant industry experts are saying. As our name suggests, we also have a passion for literature and take inspiration from great writers and philosophers, past and present. Read more about us.